Even though this week’s episode features more Mon-El than my patience can generally handle, I found it a lot more enjoyable than last week’s episode. Maybe it was the straightforward plot, or maybe it was the really fantastic J’onn J’onzz stuff, or maybe it’s because the title borrows from one of my favorite David Bowie songs and I sway easily with my pro-Bowie bias. No matter what, though, “We Can Be Heroes” was a fun bit of superhero TV, and I hope more of this sort is in store for the rest of Supergirl’s second season. First up on the list of people who think they can be heroes: Mon-El, who has been training with Kara since the last episode, I guess. I’m sure Kara is pleased, since she was excited about having a superpowered buddy back when Mon-El was more obviously selfish, rather than stealthy-selfish (we’ll talk more on that later). Things seem to be going well, too, since Mon-El graduates from training and gets the all-clear from Kara to costume up and get to savin’ people. Of course, then news that Livewire — the electric-powered villain and Supergirl-hater who definitely does not want to be a hero — has escaped her prison cell reaches Kara and they have to deal with that. When Livewire attacks some NCPD officers, Mon-El proves that he’s not ready to fight by Kara’s side when he ignore Kara’s order to protect the normal people (who were trained police, granted, but still significantly more killable than either Kara or Mon-El) at all costs. Also, Mon-El’s costume is a complete disaster. 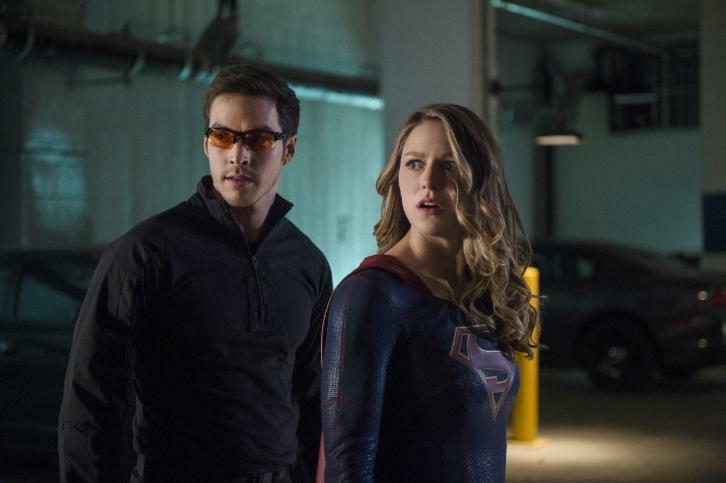 How can Kara team up with someone who decides a hero costume is a black coat and ugly, yellow-tinted sunglasses? Disgraceful. And here’s another wannabe-hero of the episode: James, whose identity as Guardian is revealed during the Livewire/NCPD kerfuffle. Kara is, of course, angry that James kept his superhero alter-ego a secret from her. She’s doubly angry when she learns that Winn and Alex both knew about his hero hobby, and that Winn even helped James regularly and made his suit. The team learns through security footage that Livewire hadn’t escaped prison — she’d been kidnapped out of it, to be used as an energy source for some mad scientist dude’s evil schemes. Winn keeps yet another secret (such a good idea, Winn! Totally not making things worse!) about being able to track the villain down so that he and James can go alone, in order to prove that Guardian can be a useful ally. Mon-El tags along and, because they’re idiots, all of them get captured by Mad Scientist and have to be rescued by Kara. Of course. Kara needs smarter friends. The big finale has Kara imploring Livewire not to kill Mad Scientist despite all the evil things he did, and then letting Livewire go when she doesn’t choose to murder. I... guess that’s cool? It’s very obvious that Livewire isn’t going to turn to the side of good, but Kara’s an optimist to the core, so I guess she still has hope. Good for her. And the last could-be hero of the hour (yes, there’s three!) is my favorite and the highlight of the episode, in my opinion: J’onn J’onzz. M'gann M'orzz, the imprisoned White Martian, starts the episode by shouting things about blood and death and “beautiful war,” then falls into a coma that seems to be slowly killing her. There’s a chance that J’onn could save her with a Martian Mind Meld (you know, like a Vulcan one, but with less Spock) but he has to put aside his deep-seated hatred of White Martians first. He has to accept the idea that melding with her means sharing his memories of his family with someone he can’t help but see as an enemy. In this situation, J’onn is a reluctant hero — but he is (more than the others of the episode, perhaps) most certainly a hero. He saves M’gann’s life with the meld, going into her mind and seeing one of her last memories of their home planet. She confesses to him that she killed the other White Martian guards after they ordered her to kill a Green Martian child, and that she was certain she’d never make it out alive. J’onn tells her that she makes it out, that she gets to Earth, and that the two of them can work on being friends. Then she tells him that her whole scream-induced coma deal was because the White Martians had found her and are on their way to Earth, so that puts a bit of a damper on things. Whatever, it was still a wonderful plot and I want a significant increase of J’onn J’onzz on this show, pronto. Bring on the lies and deception! What’s a superhero show without some lies and deception, right? (Answer: a better superhero show, but let’s just sigh and get on with it.) This week, it’s James and — to a lesser extent — Mon-El who are caught up in some tangled webs. James, as we all know, has been keeping his role as Guardian a secret from Kara since the beginning. We learn that it’s been months since James got found out by Alex and he hasn’t made any effort to confess to Kara outside of his faltered attempts during Thanksgiving dinner. He makes a halfhearted effort in this episode, but gets all mopey when Kara starts going on about Mon-El’s hero training. Look, show: is Kara/James still going to be a thing? Credit to you for giving James a little jealousy, here, since the abrupt end to their romance and zero hints at lingering feelings has made no sense, but... I just don’t know. So anyway, James never tells Kara the truth and when she does find out, it’s an accident — he gets unmasked during a fight. That’s a point against James. Personally speaking, I think James makes up for it (just a tiny bit, mind you, since I am endlessly frustrated with people lying to each other on these kinds of shows) when he tells Kara why he wants to be Guardian: James doesn’t want to be a hero for glory, or for feeling powerful, or to even out the moral playing field between himself and his superhero BFFs. He wants to be a hero to help people, period. He knows that he’ll be putting himself on the line, but he wants to do it anyway because he feels like he should do his part to keep people safe and help where he can. It’s the purest hero-motivation a character could possibly have, but Kara doesn’t accept it. No powers, no training, no Supergirl ally. She doesn’t want to stand by and watch someone she cares about get hurt, and the fact that he’d kept it from her is a pretty strong indication that he knew what she would say about it. Now, I’m not sure how differently things might have played out if James had been honest with Kara about what he was doing, but I suspect the truth would have softened her at least a little. And finally, Mon-El. Hey, you know who doesn’t have pure motivations for being a hero? Mon-El. His incentives are a stark contrast to James’s, as it finally becomes clear to Kara that her new superhero buddy is a lot more interested in spending time with the pretty Kryptonian than he is in actually keeping people safe. I kind of like the contrasts of James and Mon-El in this episode, actually: Mon-El’s lie about not remembering kissing Kara, about having feelings for her, is a pretty innocent one, while James’s lie is a lot bigger but a lot more sympathetic. Mon-El’s motivations are selfish, while James is propelled by a selfless desire to do good. Kara supports the selfish Mon-El’s heroism because he has powers, while she denounces the more pure intentions of James because he doesn’t have powers. Nervous Kara was a lot nerdier in her mannerisms than Regular Kara, which I enjoyed a lot. "What is that, a toy?" "No, it's expensive." The simple delivery of that very simple line was absolutely hilarious. It doesn’t even really sound like a punchline, but it was so good. James Olsen: Professionally Handsome Desk Person. Oh, yeah, and Kara/Mon-El stuff happened. But Kara seemed unhappy with it, so I thought it was safe to ignore.